Intertops Poker and Juicy Stakes Casino are hosting a special Memorial Day Slots Raffle and launching a new Betsoft slot on Monday. Memorial Day in the U.S. is a day when Americans honor the brave soldiers who have died fighting for their country. On Monday, you'll automatically earn raffle tickets when playing designated games. A Night in Paris, Fire & Steel and True Sheriff, all listed under the Betsoft tab within the poker software. You get one free raffle ticket for every 10 spins with a wager of $.60 or more. Five randomly drawn winners will receive $1000 in prizes. Raffle prizes must be rolled over at least once on Betsoft games. "We owe a lot to the soldiers that have fought to protect us," said Intertops' poker manager. "But that doesn't mean we can't have a little fun on Memorial Day!" Intertops Poker and Juicy Stakes Casino have busy poker rooms attracting all kinds of players from all over the world. They also offer a wide selection of slots and table games from Betsoft, Worldmatch and Lucktap. 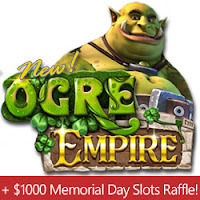 The new Ogre Empire slot makes its debut on Monday. In the new game, an ogre occupies the kingdom day and night. During the day, the townsfolk hide, leaving the town -- and the reels -- to the whim of his temper. When he has a tantrum, he can cause the reels to award additional prizes. At night, when the Ogre falls asleep, the townsfolk slip out of hiding and onto the reels. The magical Day Bloom Wild, a wild flower that blooms only during the day, spreads to up to three other adjacent symbols. At night, the mystical Night Bloom Wild shoots its glowing spores on up to three other symbols anywhere on the reels, turning them wild as well! The Joker also comes out to play at night and when he appears in a winning combination he doubles the payout.